National Integrated Development Association Kohistan Khyber Pakhtunkhwa. Master degree in Education or related field. At least three years of experience in relevant field. Master in Education, Social Sciences or related field with 3-4 years' relevant practical experience with NG0s/ING0s. Knowledge of Pashto and Kohistan Language i-e speaking & Understanding. M.Com, MBA Finance, B.Com (honours) 4 years, BBA Finance with five years of practical experience in the social sector. M.Com, MBA Finance, B.Com (honours) 4 years, BBA Finance with two years of practical experience in the social sector. Master degree in Business Administration, Economics, social sciences or related field. At least two years of experience in design, implementation and monitoring. Master in Computer Science or related field with 2 years of experience in NG0s/ ING0s. High school diploma with knowledge and experience in the office. Send your detailed CV on newrecruitmentjobs@gmail.com, the last date is October 21, 2018. Local candidates from district Kohistan will be highly preferred. 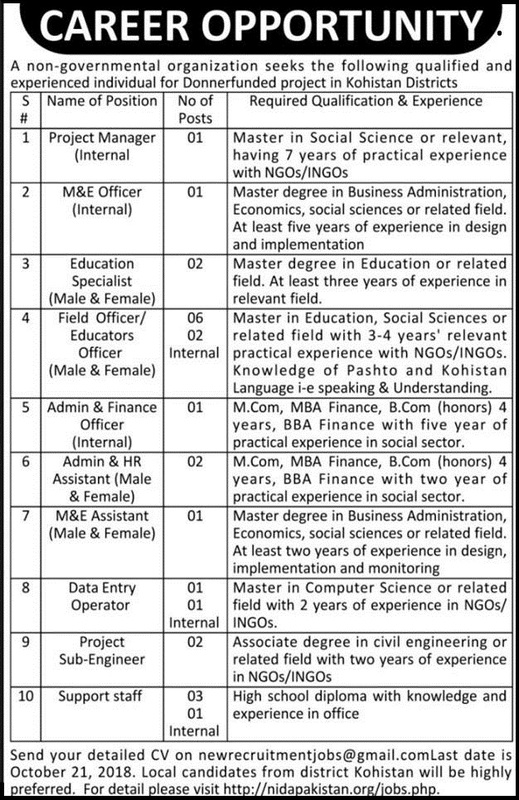 For detail please visit http://nidapakistan.org/jobs.php.